Here’s a book review I wrote back in 2010. A most amusing must read! 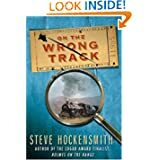 On The Wrong Track by Steve Hockensmith finds Big Red and Old Red Amlingmeyer working as professionals “detectifying” for the Southern Pacific Railroad in the year 1893. Robin, a great review of what seems to be a great and entertaining book. Thanks for that review, Robin. I’d forgotten all about Steve Hockinsmith. I read his “Holmes on the Range” a few years ago and laughed out loud. It was the perfect gift for my friend’s husband who is a “reluctant reader”. . . macho yet very silly and light. It’s also got that whole detective thing going, so that mystery lovers will get a kick out of it too. A great dessert book. Thanks, Jeanne! Yes it is a very funny book. I bought all four of his books in the cowboy detectives series.